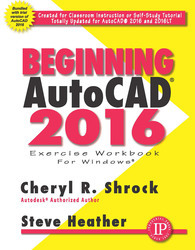 Beginning AutoCAD 2016 Exercise Workbook by Cheryl Shrock and Steve Heather is the right book for users new to AutoCAD or who want to brush up on the basics. This is a clear, no-nonsense, easy-to-follow text that helps user learn AutoCAD quickly and easily. Provide detailed instructions, followed by exercises (which print on 8 1/2” x 11” paper) for practicing the commands you just learned. Also check out the author's Advanced AutoCAD 2016 Exercise Workbook, plus the handy companion book AutoCAD Pocket Reference.